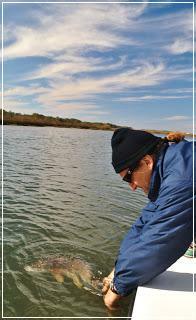 The weather on the Cape Fear Coast has been stellar this season and the fish have enjoyed the mild s eason as well. It's been a great start to 2012 to have fished so many of my excellent anglers and fly rodders and I'm really excited to get to fish with many more of you in the coming months. This Thursday and Friday I had three of my good friends and anglers out on the water for some cool weather redfishing and we were not disappointed. On Thursday I guided local anglers Tommy and Kent on a half day adventure. On Friday angler Dana Eddings whose son Josh starred in Redfish Can't Jump with us dusted off his Scott and brought a shiny new Nautilus reel to test on some animals. Both days were filled with plenty of laughs, good casting, cold morning runs and fly lines getting tightened up. Kent's Hells Bay Marquesa is in Florida getting polished and cleaned up by the talented crew at the Hells Bay factory for the upcoming season. He had the need to cast a fly and was kind enough to call me to guide he and Tommy to some winter schooling reds in the marsh. Kent is an excellent fly angler and made good use of the stripping bucket mounted on the new bracket. He offered some good feedback on the position of the bucket and it really came in handy as Kent is tall and the wind, as always, was a factor. Tommy had a couple of tugs early working a DOA Jerk Bait on the second school we found but never got a clean hook up. 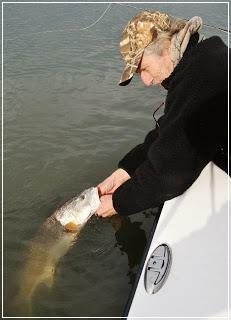 Kent persevered and was rewarded with a tight line several times and a n ice fat redfish. On Friday Dana and I had the luxury of some really clean water on the low tide and while we spotted a couple of nice fish and one large 30 incher in the shallows the fish proved to be really spooky. We didn't waste any of our tide or time and quickly hit one of my favorite little tributary creeks. Unfortunately while we found a large number of fish in this particular location the water had been roiled by mullet and the previous days' windy conditions. Time to move again... Boy were we in a tight spot when we began the move. The wind started to breeze up and all of our good bluebird skies were replaced with a gray leaded sky. Not to be beat by the conditions Dana and I made the best of our time and went aggressive on a school that I had pegged. As I poled Dana close I gave him the exact location of the school from about thirty yards out. I couldn't see them in the gray light and light wind chop but I sensed they were there... When we got within forty feet of where the school likes to stage Dana turned a nice loop loose in their direction. On his third strip the line came tight and I think we were both surprised. It was a stud. Being caught off guard when a fish eats is dangerous, you either a) overcompensate with the hook set going up instead of strip striking or worse, b) not getting a set at all before the fish turns and heads for the next zip code, this fish chose option B. It was a rodeo and the fish came off the hook cleanly in the first fifty seconds. We were both bummed, talked about the angles and what potentially went wrong and quickly got back in the game. We tried to reposition on the school but they slid into deeper water after their buddy shook the hook. We grabbed a bit of lunch to let things settle down...Dana got back on the bow and we quickly re-engaged the school. Another nice cast and Dana hooked into an even larger fish. The Nautilus purred smooth as a kitten when the ten pounder peeled Dana's drag. It took a little will power but Dana subdued the fish and once boat side I made fast work of the lan ding procedure. What a fish to start the year with. So far my biggest of 2012 on the boat and Dana landed it in less than ideal conditions, that always makes the rewards that much sweeter. It's been an awesome start to the new year and I'm stoked to get to fish with you all this coming season. 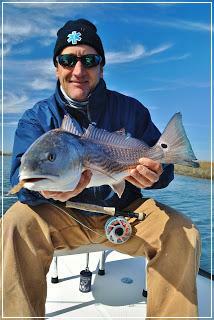 There's plenty of winter sight fishing opportunities on the coast. I look forward to seeing you on the bow this season.